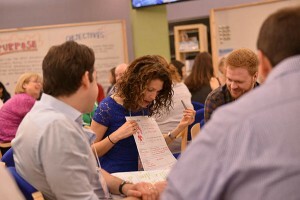 Innovation Loft at Front End of Innovation 2015 | Boston, MA - Innovation Loft | UNLEASH YOUR TEAM’S POTENTIAL! This year’s Front End of Innovation Conference is bigger and better than ever before, and Innovation Loft has been asked to be a part of it! With the largest innovation and collaboration community in the world, FEI is the world leader in advancing innovation. Along with big-name keynotes (Seth Godin on Disruption, Steve Blank on Lean, Tom Kelley on Creativity,) Innovation Loft will be in the middle of the action, sharing our break-through techniques with innovation students and professionals alike. We’d love for you to join us! You can use the code FEI15LOFT when registering to save 20% on your conference registration fees. Innovation Loft @ FEI is a highly creative brainstorming workshop environment created right on the show floor, between booths 1 & 26. As a Front End of Innovation 2015 attendee, you’ll have a chance to tourInnovation Loft @ FEI, a purpose-built facility optimized for creative collaboration using principles of Collaboration Environment Construction. You’ll get free tips and consulting from the experts at Innovation Loft about how to construct environments at your own offices that are optimized for creative collaboration, and be invited to participate in brainstorming sessions based on discussions by FEI keynote speakers and led by the Innovation Loft team. Participation in these sessions will be available by signing up at the Innovation Loft @ FEI when you arrive, and will be an opportunity to learn the types of game-ified ideation techniques that are profiled in the upcoming book TeamStorming: How to Lead Ideation Sessions that Generate Breakthrough Results. These are the same techniques the Innovation Loft team uses to help clients like Avis, Visa, Nutrisystem, Clear Channel and NBC to develop highly novel solutions to challenging problems with maximum team alignment. large, dry erasable and magnetic walls that will help you to give ideas life – as a key part of this specially-designed mobile innovation habitat. Don’t forget to stop by while you’re on the show floor — you won’t want to miss this! As a whole new breed of nimble companies swoop in and change the face and pace of innovation, FEI: Front End of Innovation 2015 has you covered. Dreams, Doers, Instigators, Roboticists, Entrepreneurs and self-proclaimed “Troublemakers” are inciting disruption on the FEI stage. The event is redesigned to help you navigate the new innovation world order. With even bigger name keynotes (Seth Godin on Disruption, Steve Blank on Lean, Tom Kelley on Creativity), eight “adventure learning sessions” designed to get you behind the scenes of Boston’s most innovative companies (think Pfizer, Reebok, Optum Labs), the launch of the highly-anticipated Startup Lab, the 2nd annual power women panel, and FEI “unplugged,” we give you unedited access to the people you need to know, now. The cumulative result? FEI empowers you to become your most productive, agile, and connected self.